If you’re about to have new shingles and/or siding installed on your home, then it’s time to take a look at samples that you can mix and match to make the most of your home’s exterior. Matching your home’s siding and shingles may seem daunting, since you want to get it right the first time, which is why it’s so important to weigh your options carefully. As your local roofing and siding experts, we have a bit of experience in dealing with these elements of your home, and we’d be happy to help you make a decision — we provide roofing services for folks throughout Southeast Michigan, and we can work with you to make your vision come to life. 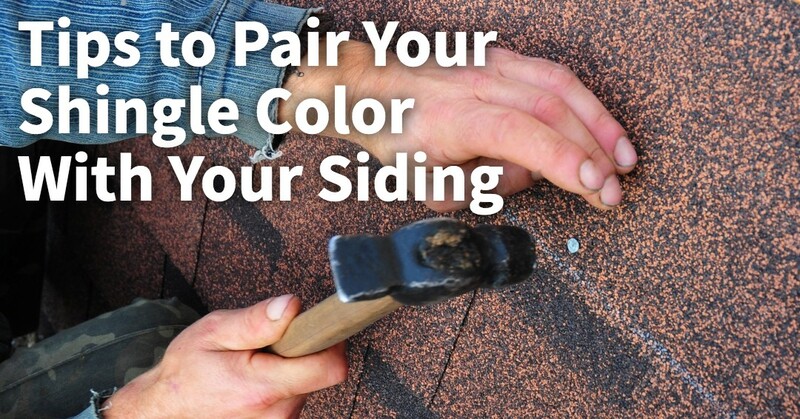 In addition, we’ve accumulated a few tips that you can read through right now to help you get started — here are our favorite shingle colors and their best siding pairings. Black looks great atop nearly any roof. Consider black shingles if you have a smaller roof, since the darker color won’t overwhelm the overall look of your home. You can also consider black if your home has a modern look, since it will serve as a stark contrast against most siding colors and materials. You may not want to use black shingles if your home has siding that is especially dark, since it can be overpowering. In addition, you may want to shy away from black shingles if you have a home that is pure white, since the stark contrast may be off putting. Brown is an earthy tone, and as such, it works well with homes that have natural siding and other features. Consider a brown shingle roof if you have a home with a brick facade, walls that feature stone pillars, or even wooden siding. All of these features will work hand in hand with your brown shingles to make your home appear as if it were a natural part of the landscape. You can also pair brown shingles with other neutral colors to give your home a quiet, elegant look. For example, you could install brown shingles atop a home with blue-grey siding to provide some interesting contrast without being overbearing. Charcoal colored shingles are another popular choice, and the reason is simple: Greys work with nearly any type of siding and color. If you’re struggling to settle on a shingle color for your roof consider grey shingles, especially those that are multi-toned. Multi-toned grey shingles break up the composition of your roof, providing it with an appealing texture. The only color of siding that you may want to steer clear of if you’re going for grey shingles is grey itself, since grey on grey can be a bit too monotonous. Neutral blues aren’t as popular as the aforementioned options, but they’ve proven to be a good choice for homeowners. You can find darker blue-grey shingles atop homes with natural features, since the tone is akin to sky coloring reflecting off of slate tiles (a traditional roofing material that used to be commonplace, but now is often too expensive or heavy for modern homes). Neutral blues also work well with blue siding that is different in tone, or white and off-white siding options. If your home is surrounded by natural features throughout its landscape, then green shingles may work to complete a lively feel for your property. You can consider neutral green shingles if you have a home with plenty of natural elements (like neutral blue that we mentioned above), or for homes with earthy siding colors. Green can be accented by red elements throughout your landscape or on your home (like a red front door, or red shutters). If you’re ready to transform the look of your home, or you’re finishing a home with its final feature — the roof — then we’re here to help. You can count on us to install new shingles on your roof to top off your home. Feel free to reach out to us to get started, or if you’d like to learn more about our roofing options and Owens Corning shingles.